Do you realize you can make money from teaching something you love? It’s true! And it’s never been easier! 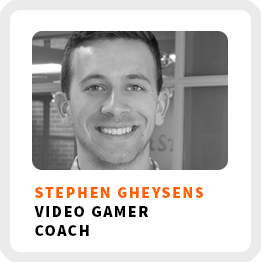 Our guest today, Stephen Gheysens, discovered a way to help video game enthusiasts make money by teaching others their video game skills. He’s the founder of Gamer Trainer, a coaching platform for people who want to level up their video game skills. His platform has been live about 3 months since we had our chat. How Stephen took two pivots in his career to start his current business. How he defines what it means to be engaged with your work. Why you don’t need funding to start your business. We getting customer feedback helps develop your business more quickly. Business model for his on-demand coaching platforms. Core work activities + habits: 1) Ensure progress on development every day. 2) Engage with customers, both trainers and students. 3) Building up processes and automation on the backend of the business. Ideal work environment: Mixing up the environment between his home office and a WeWork space. Resource recommendation: Mentors – from professors in his entrepreneurship courses to the CEO of one of the companies he worked for previously. 90-day goal: Book 100-150 more lessons, look into other tools to integrate with the platform, possibly grow the team more. 1) Talk to your potential customers and audience as early as possible to get feedback and different points of view that will test and improve your idea. 2) Build lasting connections with some of those people and use your network as an accountability tool.